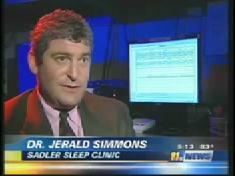 ADHD linked to sleep problems in children: Dr. Simmons interviewed with one of his patients. Medical Matters News, July 27, 2010 article: Victoria Wright, Sadler Clinic. It has recently become clear that there seems to be an association between sleep disturbances and Attention Deficit Hyperactivity Disorder (ADHD) or Attention Deficit Disorder (ADD). It is not hard to comprehend that disturbed sleep can lead to symptoms of ADHD or ADD. A normal child who is un-rested or is up past a typical bedtime frequently demonstrated poor behavior and lack of impulse control. Studies have described Obstructive Sleep Apnea in some children who presented with hyperactivity who after receiving treatment for their obstructive respirations demonstrate resolution of their daytime symptoms. Additionally, PLMS and the Restless Legs Syndrome have been found in patients with ADHD who also demonstrate improvement in ADHD symptoms after treatment for the RLS / PLMS disorder. Stimulant medications such as Ritalin and Adderrall work by treating the ill effects of the fragmented sleep and pharmacologically mask the symptoms of sleep deprivation in these patients. Another way to achieve this effect would be to treat the underlying cause by resolving or preventing the fragmented sleep and therefore eliminating the need for stimulant medications. In children who have obstructive respirations as the cause for their fragmented sleep the initial treatment is with continuous positive airway pressure (CPAP) therapy. This is the first step, and observations are made to determine if treating the child's airway provides improvement in their daytime symptoms of ADD or ADHD. If improvement is recognized then the next step is to consider orthodontics. The child's airway can be modified to improve breathing though orthodontic means. Frequently this requires widening of the hard palate and / or bringing the mandible and maxilla forward. These orthodontic maneuvers frequently require the child to wear head gear at night. The challenge during that stage is to be sure that the child can wear the head gear while also wearing the CPAP mask. This is only a temporary requirement. Once the orthodontic changes have occurred then in many cases they no longer a need to use CPAP and breath at night is restored to normal and the ADD / ADHD symptoms are no longer present. Does your child snore or make labored respiratory sounds while sleeping? Does your child frequently breath through his/her mouth while asleep (sometimes evidenced by drooling on the pillow)? Does your child frequently waken in the morning with nasal congestion which was not present before going to bed? Does your child make frequent kicking movements during sleep or frequently kick up the sheets while asleep? Does your child appear sleepy during the day while sitting still? If the responses to these questions are positive for a child with ADHD or ADD then consider having the child evaluated for a sleep disorder. Sleep disorders do not explain the cause of ADHD or ADD in all children but clearly a significant percentage of cases can be attributed to a sleep problem. It is necessary to have a child evaluated properly first before concluding that there is an association and it needs to be determined on a case by case basis. More work needed in this area to further extract how to best identify and treat these individuals. What is clear is that for many children treatment does not have to consist of stimulant medications and treating a sleep disturbance (if present) is the best option. Ali, N J; Pitson, D; Stradling, J R. Natural history of snoring and related behavior problems between the ages of 4 and 7 years. Archives of Disease in Childhood, v.71, n.1, (1994): 74-76. Carskadon, M A; Pueschel, S M; Millman, R P. Sleep-disordered breathing and behavior in three risk groups: Preliminary findings from parental reports. Child's Nervous System, v.9, n.8, (1993): 452-457. Ali, N J; Pitson, D J; Stradling, J R. Snoring Sleep Disturbance and Behavior in 4-5 Year Olds. Archives of Disease in Childhood, v.68, n.3, (1993): 360-366. Stradling, J R; Thomas, G; Warley, A R H; Williams, P; Freeland, A. Effect of adenotonsillectomy on nocturnal hypoxemia, sleep disturbance, and symptoms in snoring children. Lancet (North American Edition), v.335, n.8684, (1990): 249-253. Kaplan, B J; Mcnicol, J; Conte, R A; Moghadam, H K. Sleep Disturbance in Preschool-Aged Hyperactive and Nonhyperactive Children. Pediatrics, v.80, n.6, (1987): 839-844. Picchietti DL, England SJ, Walters AS, Willis K, Verrico T. Periodic limb movement disorder and restless legs syndrome in children with attention-deficit hyperactivity disorder.